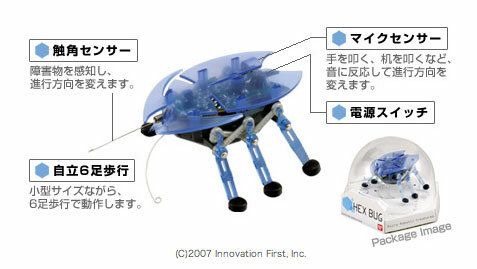 Bandai will shortly be releasing five little see through, walking virtual insects called Hex Bug. Bandai refers to them as Micro Robotic Creatures. Hex Bugs recognize when their feeler antennae hit something and turn away from the obstruction. Plus if you clap your hands, they will change direction. They name them by color. Charley is blue, Echo is red, Bravo is green, Delta is yellow, and Alpha is orange. HexBug is available in the U.S. from Radio Shack and hexbug.com . A robotics group is offering a $6,000 prize for the first photo of a special edition Gold HexBug (only one was made) along with the secret code from the bottom of its box. The Gold HexBug is in an undisclosed Radio Shack store in the U.S. There is one of each color and style in a set – red/pink, green, yellow, blue and orange. So, a set has five robotic insects. You can order them at RadioShack.com, but you cannot choose the color that you want. Love to purchase 2 bugs for my kids. How much to Australia and how quick can you deliver them to us? ?